For much of the U.S. east of the Rockies, middle to late January tends to be the coldest time of the year. 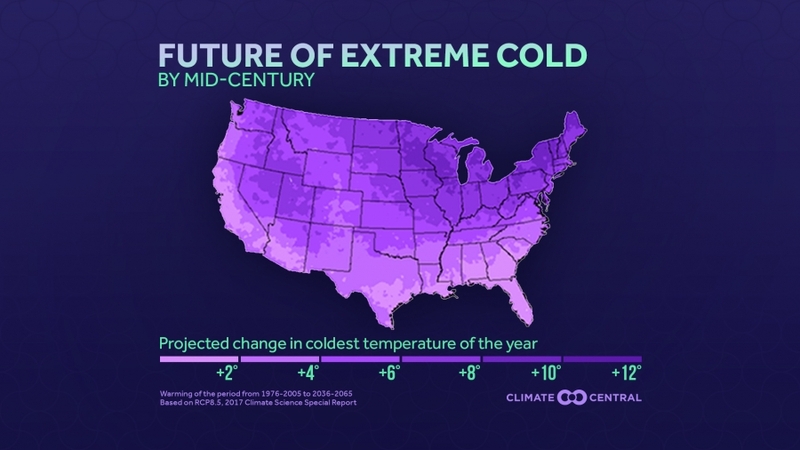 Even though extreme cold can still happen in winter, as was seen earlier this year in much of the country, the frequency and intensity of extreme cold is declining as the world warms from the increase in greenhouse gases. Digging deeper, this week’s analysis examines the coldest night each year in cities across the country, and in most cases, the trend in that coldest night is warmer. While the decrease in cold may sound good on a cold winter day, that warming comes with consequences for farming, recreation, economy, and the environment. Fruit trees, which need to become dormant over the winter to bloom in the spring, may produce smaller yields. Winter-based activities in colder climates, like skiing and snowmobiling will become less prevalent, and the tourist economies that support them may struggle. More disease-carrying insects, like ticks and mosquitoes will survive through a milder winter. Methodology: Minimum temperature data for individual sites is analyzed through 2017. Projections are from the 2017 U.S. Climate Science Special Report. Changes in minimum temperature extremes reflect the difference between the average for mid-century (2036-65) and near present (1976-2005) under the RCP8.5 emissions scenario, and are derived from 32 downscaled climate models. Former Weather Channel meteorologist Guy Walton maintains a comprehensive records database, analyzing monthly, annual, and decadal records trends based on NCEI data.